WatchON is your TV guide plus remote control. For Galaxy tablet and Note 10.1 users, you probably tried this Peel Smart which is shipped together with Galaxy Tab 2 in some regions. WatchON can be considered as improved and optimized Peel Smart for phones. WatchOn uses the device’s IR blaster to turn the S4 into a programmable TV (and setup box) remote control. It also recognize your TV and cable/satellite provider and displays a programming guide. It also suggests different programs based on your preferences, provides program schedules, and does the channel surfing for you. Because WatchON is an app, you just start the app to use it. We will post a demo later for WatchON. 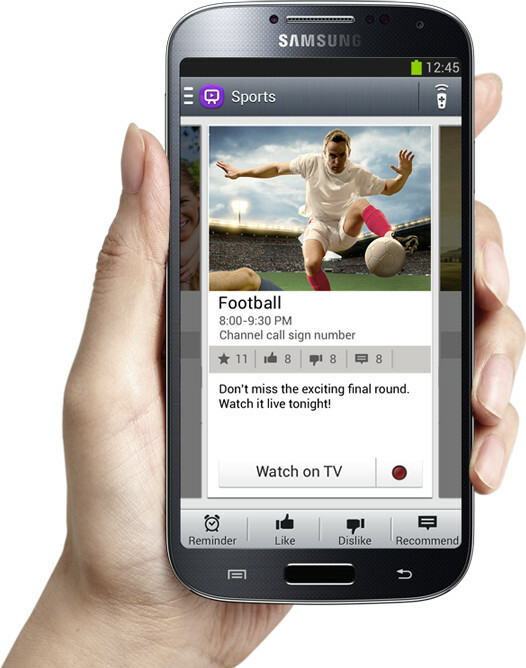 Q1 : Does WatchON operate as a remote control for manufacturers other than Samsung? A : Yes – the remote control feature supports for other companies e.g. Panasonic, Sony, Sharp, Toshiba LG subject to the specific model specification. Q2 : I tried to set up WatchON, but it doesn’t work. A : Please see advice below on how to set up Watch on. NOTE: A network data connection or Wi-Fi connection is required before commencing this process Connect to a TV to display the device’s screen onto a large surface and control the TV remotely with the device. Select a country and a region. Tap → Set Up Now, and then follow the on-screen instructions to register the TV to the device. The steps vary depending on the options you choose. To connect to other devices, tap → Settings → My room → Add devices. Q3: How far is the range of the WatchON remote control function? A : It is capable of operating in a 5m radius from the TV, up to a distance of up to 15m in a straight-line. Q4: The operation of remote control in WatchON is poor. What should I do? Q5 : Can I add multiple rooms in WatchON? A : Yes, it’s possible. You can create extra rooms through the Add room setting. Q6: Can I add other devices in one room of WatchON? ※ You can not add the same device twice in the room. Q7: A remote control-shaped icon has appeared on the notification panel. A : Please check if the WatchON feature is turned on. 1. Please check that ‘Show remote control on notification panel’ feature is turned on. Path : WatchON → Setting via menu key → Show remote control on notification panel. 2. Please check that ‘Auto display remote control on lock screen’ feature is turned on. Path : WatchON → Setting via menu key → Auto display remote control on lock screen. Q8 : I am trying to set up the WatchON feature but my country in not listed in the list of countries you select from. Is there an error? A : Sorry for your inconvenience. If you can’t find your country on the list of countries it means that the WatchON service is not yet supported in your country. However further countries will be supported in the near future (expected after June, 2013) through update via Samsung Apps. WatchON remote control app (Peel Co.) are available in the following 51 countries/regions: South Korea, USA, UK, France, Germany, Italy, Spain, Taiwan, Hong Kong, China, Poland, Netherlands, Singapore, Malaysia, Australia, Austria, Switzerland, Canada, Belgium, Japan, Denmark, Finland, Norway, Sweden, Luxembourg, Ireland, Chile, Brazil, Panama, Venezuela, Guatemala, Costa Rica, Dominican, Israel, Russia, Saudi Arabia, Turkey, Iran, Jordan, Kuwait, Qatar, Bahrain, Philippines and Thailand. is there any chance to add an ability of learning a new codes?? let`s say using the device camera as it can see the IR light emitted from remote controllers? It only uses the IR blaster. If you clear cache and clear data (settings–general–application manager–all–Samsung watchon), it should ask you to reset the app. Is it possible to use the ir remote without entering to whatchon app first? Of course, some apps may not work for you. You can then try other apps.